​Although traces of Early English (twelfth and thirteenth century) work are to be found in the chancel, most of this area is of the Decorated (fourteenth century) period. 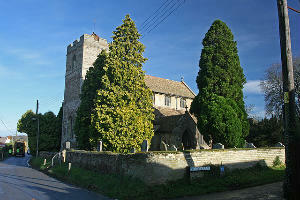 In 1352 the church was rebuilt, but fire destroyed the nave in 1448. Rebuilding the tower and nave in the Perpendicular style began in 1488. The font is of the Decorated period, the pulpit Jacobean, and, of the three bells, one dating from the fourteenth century is amongst the very oldest in the country. The east window contains fragments of medieval glass, and the south aisle stone altar was erected in 1894. During a general restoration of the church in 1929 – 30, inappropriate wax treatment damaged wall paintings, leading to recent major restoration of these works. In the chancel, paintings of foot soldiers with lances are probably thirteenth century, with fragments of foliage arabesque perhaps even earlier. Saints, the Virgin, and panels with black text, date from the fifteenth, sixteenth and early seventeenth centuries. A horned demon, symbolizing the seven deadly sins, and a wheel, symbolizing the seven acts of mercy on the west wall of the north aisle, are late fifteenth century.